Your heart muscle needs oxygen to survive. A heart attack occurs when the blood flow that brings oxygen to the heart muscle is severely reduced or cut off completely (View an animation of blood flow). This happens because coronary arteries that supply the heart muscle with blood flow can slowly become narrow from a buildup of fat, cholesterol and other substances that together are called plaque. This slow process is known as atherosclerosis. 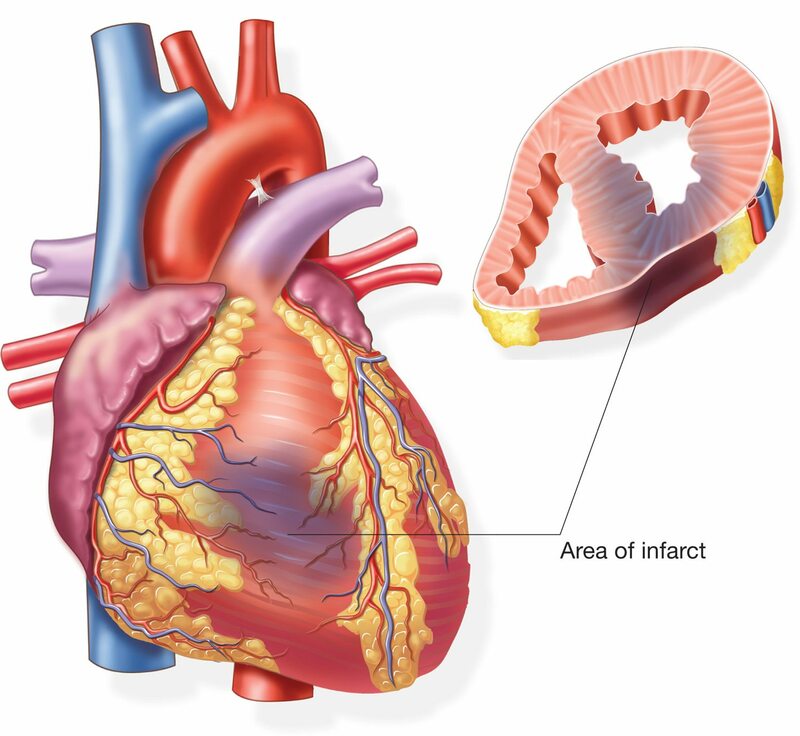 When a plaque in a heart artery breaks, a blood clot forms around the plaque. This blood clot can block the blood flow through the heart muscle. When the heart muscle is starved for oxygen and nutrients, it is called ischemia. When damage or death of part of the heart muscle occurs as a result of ischemia, it is called a heart attack or myocardial infarction (MI). About every 43 seconds, someone in the United States has a myocardial infarction (heart attack). If you are concerned that you may be experiencing a heart attack, call 9-1-1. Minutes matter! Learn the warning signs to familiarize yourself in case of an emergency. Diagnosis: How do I know if a heart attack has occurred? the patient’s complete medical history. an electrocardiogram (ECG or EKG) to discover any abnormalities caused by damage to the heart. An ECG is a medical device that makes a graphical record of the heart’s electrical activity. blood testing to detect abnormal levels of certain enzymes in the bloodstream. Blood tests confirm (or refute) suspicions raised in the early stages of evaluation that may occur in an emergency room, intensive care unit or urgent care setting. These tests are sometimes called heart damage markers or cardiac enzymes. Although you may have warning signs prior to a heart attack, the heart attack itself may be your first symptom of an underlying problem: cardiovascular disease such as coronary artery disease (CAD) which narrows and hardens your arteries around the heart or atherosclerosis which is often responsible for artery-blocking clots. To diagnose the condition, heart attack patients may be asked to undergo a number of diagnostic tests and procedures. By learning what these tests are and why they’re being done, you’ll feel more confident. These tests are important and help the doctor determine if a heart attack occurred, how much your heart was damaged and also what degree of CAD you may have. The tests screen your heart and help the doctor determine what treatment and lifestyle changes will keep your heart healthy and prevent serious future medical events. There are “non-invasive” diagnostic tests and “invasive” diagnostic tests. If you’ve had a heart attack, you may have already had certain procedures to help you survive your heart attack and diagnose your condition. Thrombolysis: Many heart attack patients have undergone thrombolysis, a procedure that involves injecting a clot-dissolving agent to restore blood flow in a coronary artery. This procedure is administered within a few (usually three) hours of a heart attack. Coronary Angioplasty/ Coronary artery bypass graft surgery (CABG): If thrombolysis treatment isn’t done immediately after a heart attack, many patients will need to undergo coronary angioplasty or coronary artery bypass graft surgery (CABG) later to improve blood supply to the heart muscle. For more information on heart attacks, schedule an appointment with Dr. Valentino today.